A prank played on a group of coffee shop drinkers to promote the remake of 70s horror classic Carrie tops last month’s Unruly Global Ads Chart. The ad was October’s most popular by a country mile, attracting almost 1.7 million more shares across Facebook, Twitter and the blogosphere than the second-placed ad, PooPourri’s hilarious “Girls Don’t Poop” It attracted more then 2.1 million shares in October. You can throw as many special effects or clever catchphrases into your marketing mix as possible, but apparently nothing beats the sight of a little girl throwing up. Or at least that’s one way to look at the incredible success of Crest and Oral-B’s “Halloween Treats Gone Wrong ad”. But what they will be even more happy with is the performance of the ad. Launched just a few days before the end of the month, the commercial attracted more than 225,000 shares during October, making it the seventh most shared ad of the month. The PS4. “For The Players Since 1995” is a sedate and nostalgic journey through the history of the Playstation told through the bedroom of a teenage boy. It attracted 104,431 shares last month, almost 30,000 more than Xbox’s 19th-placed “Invitation”, which was launched a few days later. Other newcomers to the top 20 include Virgin Atlantic’s new all-singing and all-dancing safety demonstration. The next Peek of the week will be the Christmas edition! Created by CAA Marketing and the Oscar-winning animation team at Moonbot Studios, the video takes the viewer behind the scenes of Crow Foods Inc where cows and chickens are confined, brutalised and processed. All the while singer Fiona Apple serenades us with a haunting rendition of the Tony Newley/Willy Wonka classic “Pure Imagination”. Our Scarecrow becomes so disillusioned he hotfoots it back to the country where he creates his own version of simple, homely fare using Chipotle products. Chipotle are gaining a reputation for trying to raise food processing standards acrossing the industry. Once heavily invested in by McDonalds (oh, the irony) they announced earlier this year that they wanted to become the first chain of U.S. restaurants to ban GMO ingredients from its menu. The new video campaign, released along with its own app and website is set to become of the most memorable of 2013. Another nice peek of the week is the new Partizan produced clip for Gillete directed by Academy Award-winner Michel Gondry in collaboration with Phil Mossman from LCD Soundsystem. Watch NFL players in a musical experiment. As the lines between traditional and new media continue to blur, yet another terrestrial TV channel is making content available online and turning to YouTube creators to produce and star in those shows. Channel 4, one of the 5 main television broadcasters in the UK has embraced diversification in a huge way and their latest venture, an online TV commission for original talent, will be available on 4oD and on through their YouTube channel. The project, ‘Mashed‘ will showcase original short form video content based around sketches and music with further input from YouTubers such as Dan Bull and composer John Boswell AKA melodysheep. ‘Mashed’ for online will initially run for six months with new videos added weekly – Channel 4 will broadcast a selection of the best content later this year. The ‘Mashed’ consortium of independent creatives have also been commissioned to create the trailers for a selection of new programmes on the channel. The first include three humorous videos for the forthcoming series of documentary/reality show ‘Chicken Shop’ from YouTuber’sNick DenBoer, Tea&Cheese and Superpowerless. You can see the first online now. Content owners increasingly are turning to social media in hopes of being able to deepen relationships with regular viewers, and, perhaps more importantly, to attract new or occasional viewers to specific programming. But a new study suggests that while social media can help enhance existing relationships with viewers, if it’s used to often, it efficacy decreases. And, in the case of non- or infrequent viewers, social media may have little–if any impact–on drawing them into the fold. The study, from the Council for Research Excellence, found that word-of-mouth is far more likely—five to 10 times more so–to attract new or infrequent viewers to a TV show than Facebook, Twitter, or other social apps. For instance, the study found that social media holds more sway with repeaters who are over 55 and white, and for infrequent viewers who are Hispanic, African American and male. It is also interesting to see the type of content that has most impact. CRE said a second study into the relationship of social media and TV viewing, encompassing a lengthier survey of respondents using mobile apps as diaries, is expected to launch later this year. The academic review of the study was conducted by a team including The Wharton School of the University of Pennsylvania, the Simon School of Business at the University of Rochester, and The Hebrew University of Jerusalem. For repeaters, the first encounters with offline word-of-mouth, or a one-to-one electronic communication such as an email or text, or a social-media communication, are related to higher viewing — while subsequent communications can have diminishing returns. For repeaters, those receiving an initial social media message were found more likely to watch a show by one percentage point, with diminishing returns after each additional exposure to a social media message. 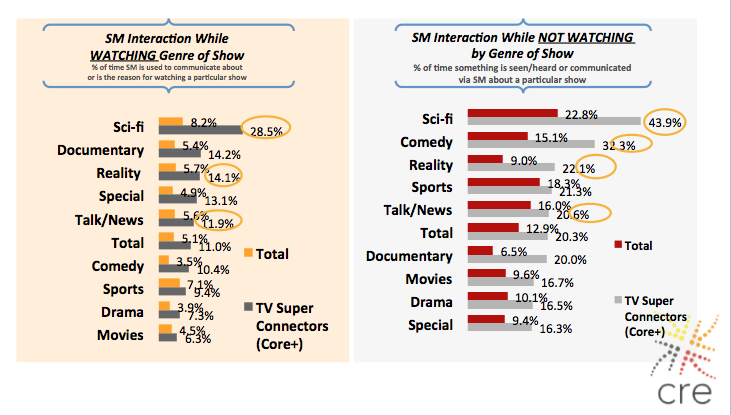 Social media plays a stronger role for genres such as reality (a nearly four-percentage-point increase in likelihood of watching), sports (more than a two-percentage-point increase) and talk shows (approximately a one-percentage-point increase). The CRE is an independent research group funded by Nielsen. Click here for more details on the research.